For runners, joggers, and even the humble power walker, the portable, secure form factor provided by earbuds is vastly superior to the relative bulk of an over-ear model. They allow you to interact with calls and music handsfree, they’re lightweight and stay out of the way, and just owning a pair makes you feel like more of an athlete than you might actually be. And that’s something money can’t often buy. 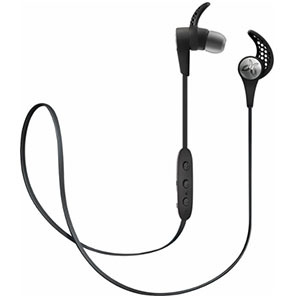 Whether you’re looking for general use headphones with some element of sports specialization or a full-on, dedicated pair that do everything except jogging on your behalf, there exists a wide range of products on offer for you to choose from. So let’s dive in. A responsive, customizable listening experience. Decent design with meaningful choices between color variants. Please label your left and right earpieces, Jaybird. Please. The third iteration of Jaybird X series of earbuds is arguably the best so far. Not only has Jaybird built so much upon an already established platform but they have done it in a way that really adds tangible improvement across the board. If you are a fan of Jaybird as a brand, these earbuds are something you can’t allow yourself to skip. Compared to the previous model, you are looking at a more functional and more comfortable solution. The performance boost is there as well, although the improvement isn’t quite as revolutionary as some would have hoped. Generally speaking, everything about these earbuds has been enhanced and improved, making the X3 the best choice for those who refuse to compromise when it comes to their tech. Sound quality is very solid for wireless sports headphones. Remote/mic combo is always a welcome addition. Despite a bulky aesthetic, the fit is great. Battery life is a little short at only ~6 hours advertised. Bose has been establishing their presence in the world of earbuds for quite some time now. Truth be told they aren’t the hottest or most popular name in the business, but they bring something many others simply can’t. We are of course talking about that legendary Bose quality. 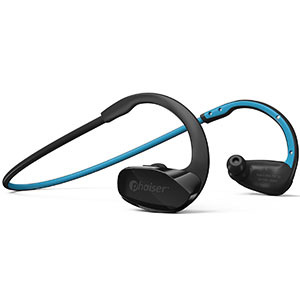 Bose SoundSport Wireless Headphones are a perfect example of what we mean, especially if you’re a runner. When it comes to things that matter the most in earbuds, Bose has pretty much done their homework thoroughly. Comfort and retention are impressive while performance comes across as something you could easily connect to Bose as a brand. The only place where Bose might have cut a corner is battery life although they have compensated for that shortcoming in more than one way. TaoTronics is one of the best names in the business when it comes to mid range, reasonably priced wireless earbuds. Their TT-BH06 tend to fit this description rather well. We’re looking at a pretty solid combination of features, a great design and much more. Those who are on a tight budget should definitely check these out. As it turns out, affordable can be pretty impressive. The defining aspect of TT-BH06 has got to be the retention and comfort factor. TaoTronics has managed to accomplish something that not many other brands in this particular market segment could. The hooks they have used combined with a great selection of earpieces ensures that these earbuds will stay in place no matter what. Add to that a good performance and you’ve got a workhorse. Great set of drivers ensures good sonic experience no matter the music genre. Combining good build quality, good design and functional layout is a good way to find yourself a perfect set of earbuds for running. Alpatronix HX250 fits this description to the letter. Its inherent design allows you to really focus on your exercise and forget about what is on your head. However, there is so much more than that to these earbuds. While Alpatronix really did a good job covering all of their bases, they have also incorporated some pretty unique solutions. These come with a built in memory. In other words, you don’t need to keep a phone with you in order to listen to music. On top of that, HX250 features pretty robust IPX7 rating, making them sweat proof and water resistant. Simple yet functional design that features improvements in all the right places. Great aesthetics will allow you to enjoy these visually as well as sonically. Good battery life and short charging times ensure plenty of use without interruptions. No way to adjust the over the ear hook to fit. Compared to most other models on the market, Phaiser BHS-530 come across as purpose built for running. You are getting a very streamlined design that is functionally great but also pretty attractive. As a matter of fact, Phaiser offers their BHS-530 in a variety of colors which should definitely satisfy just about anyone’s taste. However, looks are just the beginning. Under the hood we see a rather capable set of hardware which makes the BHS-530 a great performer across the board. These offer a great combination of comfort, retention, performance and battery life. 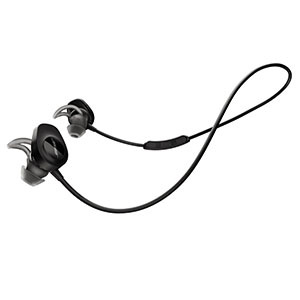 Overall, Phaiser BHS-530 come across as one of the most well rounded earbuds suitable for running and other activities, especially at this price. Affordable running earbuds don’t get much better than this. Simple design that has been proven so many times by now. Great build quality ensures positive experience over longer periods of use. Good sound quality and saturation across the entire frequency range. One of the most affordable models you can find out there. These don't offer much in terms of aesthetics or style. EVO6 earbuds represent one of the most basic solutions for runners. Whether you are on a budget or simply can’t be bothered to keep track of batteries, these earbuds will most likely work out well for you. EVO6 has left almost nothing to chance with this particular mode. They have used the already proven over the ear design which is known for positive retention. Furthermore, EVO6 earbuds pack a great set of drivers which are guaranteed to deliver a balanced but ultimately satisfactory experience. 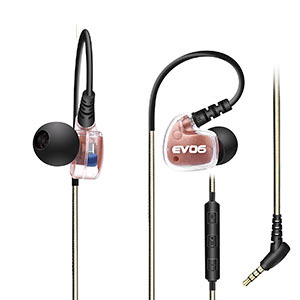 Even though EVO6 earbuds aren’t really at the top of the food chain in their segment of the market, they do come with some quite interesting features. 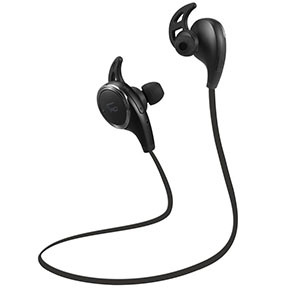 We’re talking about things such as sweat proof and water resistant chassis, great selection of earpieces and more. Reliable and proven design ensures good performance as well as good comfort. IPX4 protection prevents any sweat damage as well as water damage to an extent. Good sound with plenty of saturation across the frequency response range. Great battery life as well as short charging times make this set a good choice. Wireless earbuds come in a variety of formats. Some are quite experimental while others have pretty much proven their worth by now. what TREBLAB offers with their XR100 belongs to the latter group. 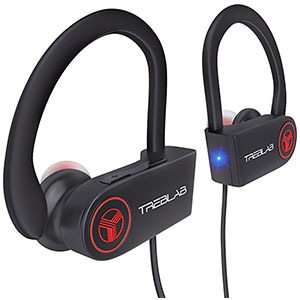 These earbuds utilize one of the older designs but one that is rock solid. The whole over the ear layout makes them great in terms of retention as well as comfort. The performance aspect of XR100 is pretty impressive as well. We have a great set of drivers which are fairly standard in nature but high quality in every aspect that matters. On top of that these offer a superior battery life to almost everything that makes up their direct competition. Chances are that you won’t find a more functional wireless set at this price. Great build quality and use of rather high end materials. Impressive set of features for such a formal looking set. Great sound and effective noise canceling technology make all the difference. Water resistance makes this an obvious choice for active users. The only flaw we can point out is the somewhat lacking battery life. 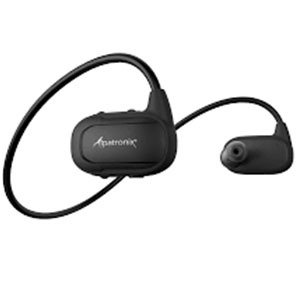 Although they don’t really fit the description of ‘active’ wireless earbuds, Amorno Bluetooth Earbuds have proven to be more than capable of keeping up with your active lifestyle. This particular set was chosen because it can be your daily driver so to speak. The chassis and overall design is classy enough for business use but also comfortable and reliable enough for running. The key features you might be interested in are pretty great drivers hidden behind the aircraft grade aluminum driver shells. This pretty much makes them resistant to drops although we definitely don’t recommend that you go test that out. Battery life is decent considering that this design utilizes a charging dock. Overall, these offer a great balance of performance and reliability at a decent price. This is fairly self explanatory. Earbuds are the clear choice for wearable audio in any sporting environment (with the possible exception of eSports, but let’s not be pedantic) because the form factor lends itself to staying out of the way while you get on with whatever personal best you have to beat. There’s a lot of scope for customizing this experience to your own requirements. If you need wireless, go for it. If you’re looking for a high-end earbuds experience that can also double as sportswear, there’s lots of them too. The market for sports-based earbuds is large, and you’ll certainly be able to find something which suits you down to a tee. If you’re in the market for running earbuds, the likelihood is that you already know the kinds of trade offs you’re likely to encounter. The main one is audio quality. Given the emphasis placed on a creating a design that looks the part, is sweat- and water-resistant, and is sufficiently lightweight to do the job without disrupting your performance, the listening experience is rarely going to be excellent. This doesn’t mean it’s outright bad by any means, but expect lots of brands to emphasise features like an artificially enhanced bass response to keep things pumping above the true clarity of a well-balanced listening experience. A few of the lower- and mid-tier models have, bizarrely, neglected to account for sweat- and water-resistance. This is an obvious error, but can utterly wreck your device if you happen to be a wearing your in-ear headphones during a particularly strenuous session. Keep an eye out, also, for the quality of the inline remote control that the overwhelming majority of offerings will include as standard. You may wish to do some earphones research into which of these are three-button remotes as having the volume control is always helpful when you’re on the move. Wireless can be tempting, but you’ll have to consider the potential downsides of managing battery life and checking for charge levels every time you set off for a run or to the gym. This is fine, of course, but takes some getting used to and isn’t quite the plug and play experience some users hope for. Running is one of those activities that can really be made easier simply by adding a little bit of music in there. Just about any set of earbuds can get you that. However, the trick is to figure out which type of design is going to work best for this purpose. Arguably, you will want something that offers plenty of retention. As a matter of fact, retention is probably the most important factor after general performance. If you think about it, the perfect running earbud is going to be the one that stays in place as you run. There are plenty of designs which will ensure this. You will see designs which incorporate various inside the ear hooks, over the ear hooks and much more. Some even rely completely on the ability of a the earpiece itself to provide retention. In our experience the best candidates for running will incorporate two methods of retention at the very least. On top of that, if you can get a model that features a physical link between the two earbuds, you will be even better off. Obviously there are some things you would want to avoid as well. First one is fairly obvious. Wired earbuds used to be the only option back in the day but they no longer are. Not only that but wireless just works so much better with running and other physical activities. Our first recommendation is to stay away from wired earbuds unless you are severely limited by your budget. 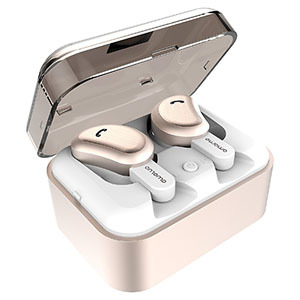 When it comes to wireless variety of earbuds, we strongly suggest that you stick to those which are fully independent or those which have a soft link between the two earbuds. The last thing you want is to get a set of wireless earbuds which have one of those rigid necklaces. Not only is it uncomfortable to have what is essentially a plastic horseshoe rocking around your neck as you run, but you might be risking injury if you fall. Over The Ear Or Inside The Ear Retention? This is a question that only you can answer as it comes down to personal preference for the most part. Obvious aesthetic differences aside, both platforms offer good retention. Over the ear type is going to be every bit as comfortable as inside the ear, however the former tends to be cheaper in most cases. One thing to consider is the selection of inside the ear hooks you get with the earbuds. The more standard over the ear variety isn’t too hard to get wrong. Chances of you running into a pair that is too big or too small for your ears is very small. However, with inside the ear hooks, that is very much a possibility. Because of that it is important that your earbuds come with a good selection of hooks so that you can find a good match. After all, comfort is extremely important when you are pushing your body hard every day for hours at a time. It’s genuinely never been a better time to buy earbuds for running or other sporting purposes. Manufacturers are acutely aware of the consumer desire for headphones which perform well enough to keep you motivated but which also feature a design that complements an active lifestyle. You can find a great variety of offerings across a real breadth of price points, and are sure to find something which will suit you down to the ground. As ever, it’s important to keep in mind that there are trade-offs you’ll have to make depending on the model you end up choosing.